How does ‘Ring Composition’ Work, Anyway? The big buzz among serious readers of Harry Potter at the end of 2010 is the revelation of Ms. Rowling’s use of traditional Ring artistry in putting together each of her books and the seven book series as well. The only thing in print on the subject so far are my Ring Composition lecture notes and, as hurried a production as that was, it succeeds in establishing the fact of Ms. Rowling’s circular wizardry — all the more apt given the assonance of her name with the word ‘rolling.’ After the fact, though, at least one reader was left wondering how such an arcane architecture for the world’s best selling books explains their popularity. I downloaded and read your lecture notes about the ring structure of the seven books. They are convincing. This is clearly an intentional and foundational structure for the books. We connect characteristics and emotions with symbols. And we can identify with alchemical imagery through our own experiences of struggle and transformation. But how does something as subtle as a ring structure influence a reader’s experience of a book? Great question; the latest variant on the big question I try to answer in everything I write, namely, “what is it about this story that makes me, the serious reader, love it?” Ring Composition, according to no less an authority than anthropologist Mary Douglas, is the nigh on universal macro-structure and story scaffolding for aural/oral cultures through several millenia, and, as you note, it is definitely the “intentional and foundational structure” Ms. Rowling has chosen for her books. We are obliged to assume, consequently, because of the longevity and pervasiveness of the form and the unprecedented sales numbers of the Hogwarts Saga books, that we are somehow hard-wired for this kind of circular story with its internal ask-and-answer resolutions across an axis of the tale’s beginning-middle-and-end. This is a difficult idea to grasp or to accept, I think, because we have an essentially materialist or dualist conception of the human person as such and with our relation to reality. If we revert from the conventional and empiricist conception of ourselves as organic chemistry body-bags with various ‘systems’ or from our “ghost in the machine” embodied-soul ideas we learned in Sunday School classes (if we were lucky) to a traditional picture of ourselves primarily as ‘heart’ or nous, we have a much better chance of getting how Ring Composition works. The traditional idea of ‘heart’ is that, as C. S. Lewis explained in his essay ‘The Seeing Eye,’ there is within us a faculty and mystery that is “continuous with” the fabric of reality. Christians call this the logos, the “light that cometh into the world in every man” (John 1:9) and understand it as the atrophied or fallen extension within the human person of “the Light of the World,” the Logos, without Which creative principle “(is) not anything made that (is) made” (John 1:3). Jesus of Nazareth referred to this faculty as the “heart” and philosophers and theologians before and since have called it different names; the Greek Fathers called it nous and the noetic and neptic (“watchful”) faculty, to Aquinas it was intellectus, not be confused with the modern word ‘intellect’ which refers to the rational, cerebral mind in opposition to the cardiac intelligence, Coleridge tagged it the Primary Imagination, and Lewis, echoing Coleridge I believe through his friend Barfield, used the simple “conscience.” All are speaking about a human means of directly perceiving the essence of things visible and invisible, a supra-personal knowing faculty with this capability because it is an aspect in itself of the ontological foundation of everything existent. This is “logos epistemology” and it is a large part of Coleridge’s response as a natural theologian to the empiricism of the dawning Industrial era in Georgian England. As such, it is close to the heart, if you will, of imaginative fiction as we have this English literary tradition, the aim of which is both to communicate in story the existence of this faculty in contrast to mundane and materialist ideas of our discursive, rational minds and at the same time to stir the reader’s heart, even foster its transformation by alchemical experience. From this understanding of man and the world springs the “bright, single eye” of the Ancient Mariner and of Dumbledore in Harry’s Deathly Hallows mirror. From it, too, comes the prevalence of mirrors in imaginative fiction, from MacDonald’s Lilith and Carroll’s Looking Glass to Galadriel’s magic pool and, well, Harry’s Mirror of Erised that knows the heart and, again, the eye in the Deathly Hallows mirror fragment. A mirror is the only natural thing in which knowing subject and known object elide, so, as Titus Burckhardt put it in his Mirror of the Intellect, the mirror is the symbol of symbolism because it reflects the means and agency of all transparencies and translucencies. Literary alchemy works its magic on readers, as well, largely because, disbelief suspended, the reader’s heart, recognizing its reflection in a story character (Harry, Bella, Anne of Green Gables, et alii), identifies with that character’s transformation and experiences their katharsis as reading subject and story object elide. The heart is illumined, that is, “turned to gold” by this alchemical work, gold understood as the alchemists did, as solid light, the only fully existent metal. The ‘action’ of alchemy is the resolution of contraries, the dissolution of alter et idem in the Word. This experience of subject-object elision in the heart is also the reason circles and rings are so important in imaginative fantasy post Coleridge. In brief, the center of the circle is, as Lord Diggory says to the King entering Aslan’s Country in The Last Battle, “the inside is bigger than the outside,” a conceit to be found in every Harry Potter novel as well (think of Hermione’s bag, the Room of Requirement, King’s Cross Station in Harry’s head, and the Weasley’s Hilton-esque tent, just to take images from Deathly Hallows). Coleridge asked a friend once, ‘[I ask that you] conceive an inside or depth, by compulsory abstraction, without, because prior to, an outside” (cited in Cutsinger, Form of the Transformed Vision: Coleridge and the Knowledge of God, page 104). This exercise is invaluable for understanding, besides Lewis’ Narniad and Rowling’s Potter, the world and self because it forces us to imagine there is a depth to things beyond surfaces, an unknowable center, that is, again Coleridge, the That by which everything is filled rather than the with what. When “disbelief,” that is, our skeptical, individual mind is “suspended” in “an act of poetic faith” as Coleridge said it must be to enter story, the heart is the operative faculty within us as we read. It recognizes as only it can, being the most subtle and discerning per uncreated aspect within us, the story-turn at its center, the resolution of contraries at the finish, and the mirrored chapters that are reflected across the story axis. No, as you point out, this is not picked up by the conscious, discursive intelligence, but, yes, it is experienced in the heart where we know most profoundly, with our whole person, really. Hence, in large part, Potter-mania. Forgive me, but the Hogwarts Adventures are Coleridge on steroids, a delivery system for the imaginative experience of the Center or Absolute beneath, behind, and within everything, as well as in our hearts. I urge you to purchase if you haven’t already, in addition to my Ring Composition lecture notes that you have, Deathly Hallows Lectures and to read chapter 5 on the eye symbolism and logos epistemology of the series finale. That is, forgive me again, the heart of literary alchemy and the power of Ring Composition. Coleridge is right, the materialists are wrong, and the love we feel for specific stories rather than others is a large part of that proof. 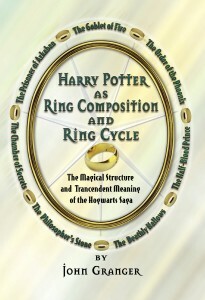 And you can buy Lectures today at Amazon and my Ring Composition lecture notes at LuLu.com. They make great gifts, too, of course, for the serious reader and Potter Pal on your gift list. Your comments and corrections are, as always, coveted. Ouch! That will teach me to type posts without checking my book shelf… It is Titus Burckhardt, of course. that I should have written here rather than Martin Lings. Thank you for the kind correction! Another “ouch”: Coleridge did not live, and the Industrial Revolution did not occur, during the Edwardian period. Gaffes Are Us. Thank you for this catch. Any thoughts about the post? 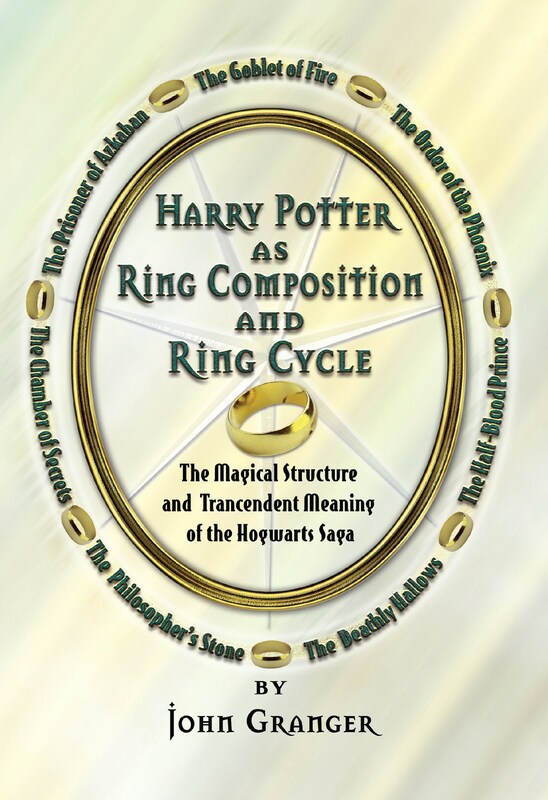 The idea that The Host might be a ring has been running through my head since I wrote my comment on chiastic structures on your post about your upcoming Leaky Con talk on Ring Composition in the Harry Potter books. I am also considering the possibility that Twilight is a Ring Composition since we already know of the significance of its central, circle-filled chapter. More thoughts to come on both of these, I promise. I wanted to share with you and your readers the following article about a new book that talks about the ring composition in the Qur’an. Sans teeth, sans eyes, sans taste, sans euery thing. Duke Senior “What would you haue? This is a very direct example of a chiasmus (ABBA: gentleness-force, force-gentleness). 2:5 There was no adam to till the adamah. 2:15 to guard and till the garden of Eden. 2:17 The adam was not to eat of the tree of knowledge. 2:21-24 To allay his loneliness God brought a partner out of the adam. The adam is now ish and ishshah, united in perfect harmony. 2:25 They are naked (arumim) and free from shame. 3:1-6. But the subtle (arum) serpent tempts them to disobey. 3:7-10 They become aware of their nakedness and feel shame. 3:16 Their harmony is spoilt: hereafter ish will dominate ishshah. 3:19 The adam must return to the adamah from which he was taken. 3:22 The adam may not eat of the tree of life. 3:24 Eden now has a new guardian to keep the adam from the tree of life. The infant, so soon arrived from nothing, ascends from mere oblivion. The whining schoolboy is awkwardly growing into his prime of body and mind. The lover with woeful ballad is singularly possessed by love. The soldier matures as he recklessly ventures abroad to brave (gentleness to force) his own life’s passage into manhood before returning soberly (force to gentleness) home with just cause and learned understanding. The justice with wise sawes is singularly possessed by laws. The whistling pantaloon is awkwardly shrinking from his once prime of body and mind. The ancient is in a merely oblivious descent back to second childishness, soon to be nothing. As thus tis so, this little life is rounded with a sleep. A ring composed of a finite number of tomorrows full of sound and fury, signifying, in the end, nothing? Duke Senior’s gentleness to force, force to gentleness speech to Orlando is a simplistic chiastic paraphrase of the seven ages of man soliloquy by Jacques wherein the progression from infant to soldier essentially represents a defined growth from gentleness to force, whereas the progression from soldier to ancient essentially represents a defined growth from force to gentleness. The soldier, with his leaving and returning home, substantiates his midpoint fourth age position in the ring composition, the turning point from expansion to compression. A man physically achieves his sexual peak just as he assumes the mantle of manhood during his fourth age, a high degree of potency maintained for much of this age before declining into the next one. Thank you for your kind sentiment. I just read your Time interview and came to the conclusion that you might be the one person that I have read that may be able to see this discovery I made in Shakespeare: In the 1609 imprint of Shakespeare’s Sonnets, Sonnet 126 is clearly laid out to show a bit of literary magic. The rhyme scheme of ababcdcdefefgg is altered to aabbccddeeff(g)(h), wherein the first 12 lines are changed from an alternating rhyming scheme to 6 pairs of rhyming couplets, and the normally rhyming ending couplet (lines 13 & 14) is now a non-rhyming pair of lines that appear to be a blank pair of parentheses, and yet they aren’t entirely blank, there are two lines from Sonnet 129 visible through the page aligned with the two pairs of parentheses, two lines that, with careful inspection, actually make sense as the final two lines of this sonnet. One test (of many) to verify the probability of this observation is to ask yourself how the printer chose the length of the space between the parentheses, was it random, or was it by design to accomodate the lines on the reverse side of the page? It appears that the creator of Ariel in the Tempest and Puck in A Midsummer Night’s Dream may have had a little more hocus pocus up his sleeve, after all.